Keith Olbermann, political commentator and writer, sits down with Charlamagne Tha God to discuss America's relationship with Russia and President Trump's administration. Olbermann can't help but laugh at the "idiots" in charge and the series of fails including the healthcare bill, Muslim ban, and the wall. This platform furthers expands Charlamagne's media brand. It's a good look for him outside of his morning radio show which enhances his presence on social media and allows him to talk about other topics other than Hip Hop and Entertainment. 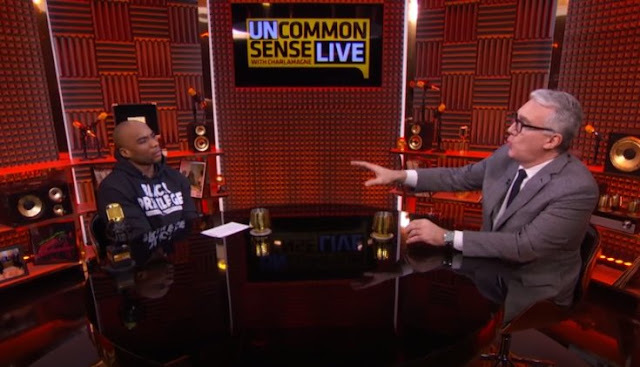 Charlamagne Tha God also chats with professor of sociology at Georgetown University and author of "Tears We Cannot Stop", Michael Eric Dyson. They discuss Ben Carson's comments regarding immigrants, whether or not President Barack Obama's legacy is in jeopardy, the deliberate amnesia of racial inequality, as well as President Donald Trump's administration.